Bucks County is one of the three original counties created by William Penn in 1682. Pennsbury Manor stands on the point of land formed by the Delaware River between Morrisville and Bristol. Painstaking research went into restoring the prim-fronted, three-storied, brick manor-house, rebuilt on the original foundations. Bristol is the oldest town in Bucks County and the third oldest in Pennsylvania. It is the southern terminus of the D&L Trail characterized by coal yards, shipyards, warehouses and textile mills. Its Delaware Riverfront resembles a New England seaport. During World War II, the shipyards were converted for use in the manufacturing of aircraft. Today, Bristol hosts special events near the river and the 50-site Radcliffe Street Historic District. The Spurline Trail presents the town’s improved waterfront and the nearby 235 acre sanctuary Silver Lake Nature Center offers three miles of trails and habitats of more than 160 species of birds, raccoon, muskrats, opossum and deer. New Hope started out as an industrial town and by the end of the 18th century it had a variety of mills, ranging from grist and lumber to those that produced flour and processed flax. In the 1820s, cotton spinning and weaving joined the list of businesses on the banks of the Delaware. Veterans from both the American Revolution and War of 1812 called New Hope home, and the streets are lined with houses dating back to that era. Most of the oldest houses are on Ferry Street. The Canal brought renewed economic activity to New Hope. During the late 1860s an estimated 100 canal boats a day passed through New Hope. During the 1920s and 30s, the village, nearby hamlets and farms became a flourishing art colony. By the mid-century, it became a stopping point for plays bound for Broadway, and home to New York and Philadelphia artists, musicians, writers and the New Hope School of Pennsylvania Impressionists. Doylestown is home to historic architecture, sidewalks lined with brick pavers and Victorian-style street lamps, the James A. Michener Art Museum, and the famous Mercer Mile comprising Fonthill Museum, Mercer Museum, and the Moravian Pottery & Tile Works. The Heritage Conservancy is a community-based organization dedicated to preserving and protecting open spaces, natural resources and historic heritage as well as conservation best practices. Yardley dates back to 1682, when William Yardley paid William Penn 10 pounds for 500 acres of land. It wasn’t until 1807 that Yardley began to develop into a village, and by 1880 the population stood at 820 residents. Early industries included a spoke and handle factory, sawmill, plate and plaster mill, and two flour mills. During the Civil War, Yardley was a safe haven on the Underground Railroad. Hiding places included the Continental Tavern, warehouse bins along the Delaware Canal, and the town’s General Store. The Yardley Grist Mill has been a center of commerce since its inception in the late 1600s. Historic Preservation much of Yardley has retained its historic integrity thanks to the creation of a well-maintained historic district. The majority of the buildings within the district are along South Main Street, with examples of Second Empire, Queen Anne, and Victorian Gothic architecture. 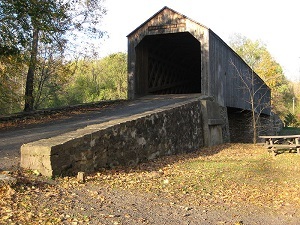 Canal Street runs parallel to the Delaware Canal and is dotted with small, predominantly frame structures dating from 1840. Canal bridges and an aqueduct are within the district as well as rows of pre-canal stone homes. The Town of Morrisville is located at the falls of the Delaware River across from Trenton and is the oldest town in Bucks County and third oldest in Pennsylvania. 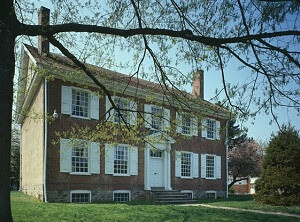 One-half mile from the falls of the Delaware River, nobleman Thomas Barclay’s 1765 Georgian mansion known as Summerseat once served as Washington’s headquarters. Declaration of Independence and Constitution signers Robert Morris, financier of the revolution and George Clymer were subsequent owners of this National Historic Site.